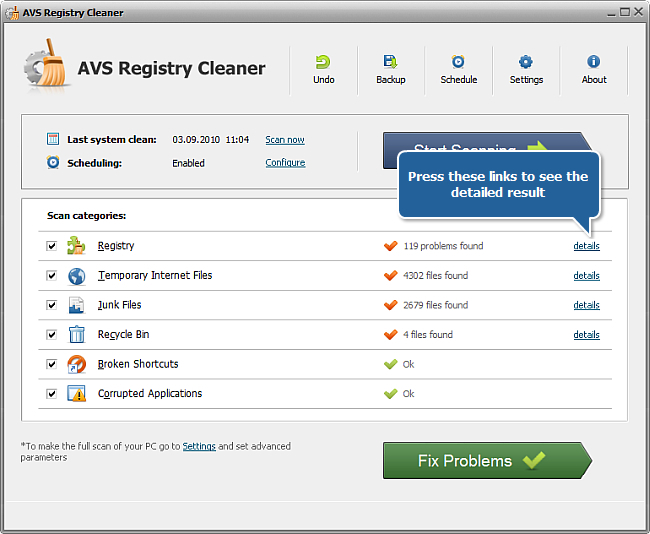 How to fix PC errors with AVS Registry Cleaner? Sometimes you can notice that your computer doesn't respond adequately. Your PC runs slowly, has annoying pop ups, restarts by itself or its screen can suddenly freeze. All these problems indicate that your PC has some errors. You can perform all the necessary correction operations by yourself. 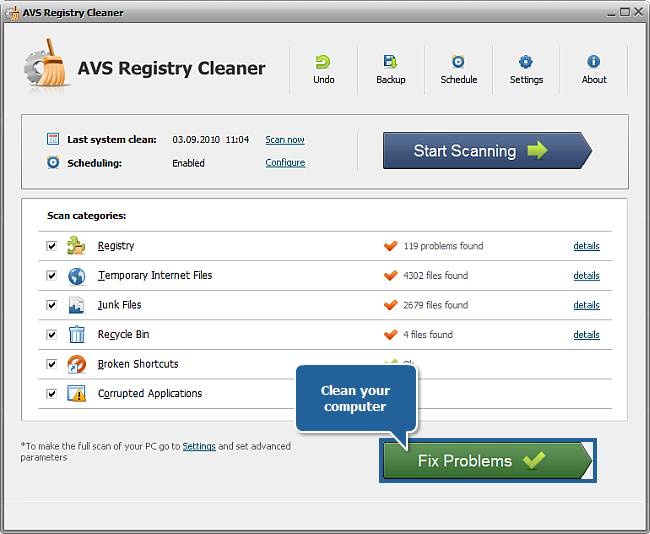 All the important information about your PC is stored in the registry so you just need to use AVS Registry Cleaner to fix any errors encountered. Click here to download it. After the download is finished, run the AVSRegistryCleaner.exe file and follow the installation wizard instructions. 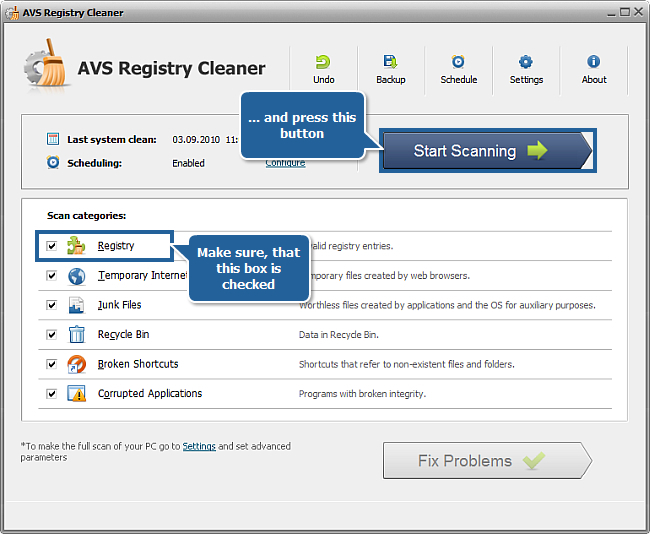 Run the AVS Registry Cleaner executable using the desktop shortcut or the Programs section of the Start menu. Before fixing your system backup your registry. It will prevent your system and its registry from data loss and will let you return to the saved state whenever needed. To do that please refer to this guide. Start fixing your computer registry. 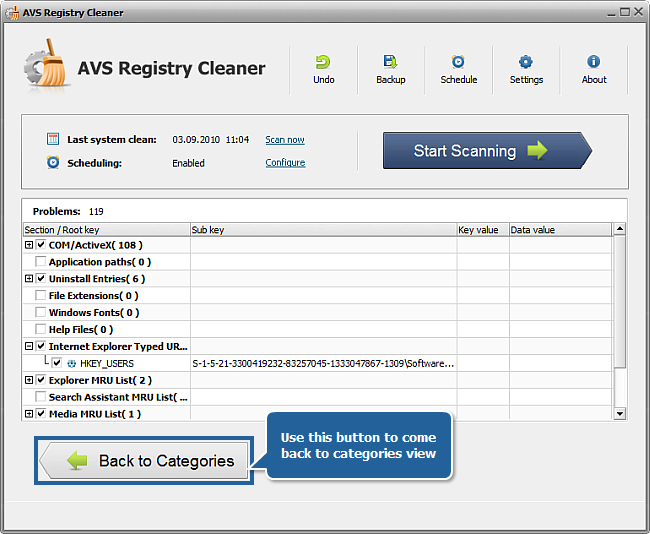 Check the Registry box in the Scan categories field to identify missing and invalid registry references. You can also check the other boxes, if you want to fix or clean the listed categories. Press the Start Scanning button. The scanning process will take some time depending on your computer configuration. You can stop the scanning process whenever you want by pressing the Stop Scanning button. Note: before pressing the Start Scanning button make sure that you have closed all the other running applications. If you haven't an information window will appear to remind you to do that. When the scanning is finished you can see the detailed result. To do that press the corresponding link. A list with different categories will be opened. Each category shows in brackets the number of entries the program will fix. Press the plus sign to be able to see the entries. To come back to categories view click the Back to Categories button. If you are ready to fix all the errors on your computer just press the Fix Problems button and wait until it's finished. Now you can be sure that you computer has been thoroughly cleaned and all the PC errors have been fixed.